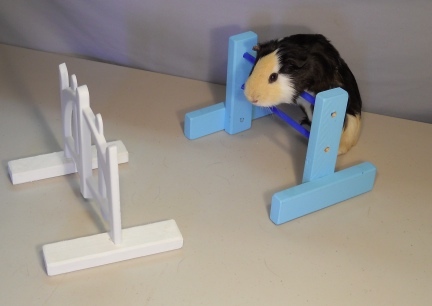 There are many different ways to train a Guinea Pig to maneuver an Agility Course. As long as it is safe for the Guinea Pig, and fun for the trainer, it does not matter how they train. I say all the time, "What works for one person, in one cavery may or may not work for another." and "Every trainer and every animal are different. What works for one, may or may not work for another." As you can tell, we are still working on this page....and training our own new GPs. I have yet to meet a Guinea Pig that was not a food alcoholic. This means, to those that train them, training should be easy. Most GPs will follow the carrot above their heads. They can also learn that once they have learned to manipulate the Agility Equipment, if they are set in front of the short course (short at first) you will be waiting, with a treat of course, at the other end. Backchaining is teaching the animal with the last piece of equipment as the last place it will end. To train your pet with backchaining to a cage or food dish you first set that item at the end of your training table. Now set your pet in front of the food dish or cage, when they take the treat or what we call at our house "go home" (go into their cage) and be sure to say the word "good". Do the same thing three times in a row three times a day. Next, set a small jump or hoop between the animal and the end piece (treat or cage). Encourage the animal over the jump or through the hoop, give the cue word for the item, we would use "over" for the jump, and "through" or "hoop" for the hoop. When the animal goes over or through, say "gooooood". You might have to move the item so that it is ever in front of your pet as the pet tries to get to the end piece or it's rewards. When it gets to the end piece repeat the word "good". Repeat this three time in a row, three times a day. When the animal is doing this well to the point of understanding, add another piece of equipment in front of the first. In other words, if the animal is doing the jump that you set up in front of the reward end item, set a second piece in before the piece it knows. Say you chose another Jump. Set the animal on the table further back and in front of the new piece or jump and teach as you did the first. As it goes over this new piece, on your cue word, say the word "good", give the next cue for the next piece that is set up between it and the end reward. When it goes over the next piece, say "good" and again say "good" when it gets to the end piece. This is what is known, tried and true, as backchaining. As soon as the pet learns that the end piece reward is just ahead, it just needs to learn how to get there. If you own a GP that is bonded to you and comes to you when called, you have a leg up on all the other competitors. The first time I realized that GPs could be taught was when I saw my own son, who was about 7 years old at the time, call his GP and it came to him. I stopped what I was doing and had him go across the room and call it again....sure enough, every time he called it came to him. Now I had owned many GPs that came when fed, called to me when the refrigerator was open, but I never, before that realized they would come to a person just to be with them. When training an animal, I can not stress this enough, spend time with it when you are not training. Just get it out, call it over, go and sit with it, and just pet and talk to it. Give food treats that you only give when you are training. I suggest yoggie treats or carrots for a GP. But something that is cut very small, about the size of a half pea, that you give to the pet only when you are training. If you GP comes when called, your training is going to go very smoothly. Most of the reason is that your GP already trusts you and wants to be near you. So when you call it and it has to climb something to get to you, no problem. If your GP is not catching on right away to what you are trying to teaching it, this does not mean your Guinea Pig is stupid. It can mean many things. Usually, it is either that the Guinea Pig is scared, or not secure, or it could be your training technics. If your GP will not take food from your hand, put it back in it's cage and start there. Hold the food, like a short carrot stick, over the food bowl and wait for the GP to come and get the treat. Don't follow the GP around the cage with the food. Wait for it to come to you. Build a relationship with your animals before starting to train them. Your GP needs to trust you before training begins. If you set a Guinea Pig in front of Agility Equipment it has no idea how to manipulate each piece. 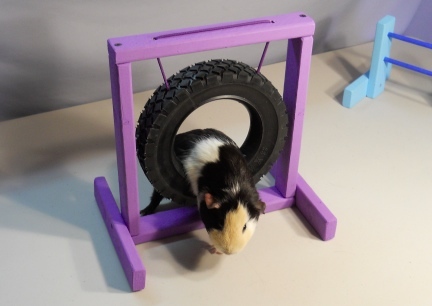 The Guinea Pig will not even understand that it is suppose to do anything with or on the Agility Equipment. It is up to the trainer to teach the GP how to manipulate each piece first, then a row of Agility Equipment, known as an Agility Course. 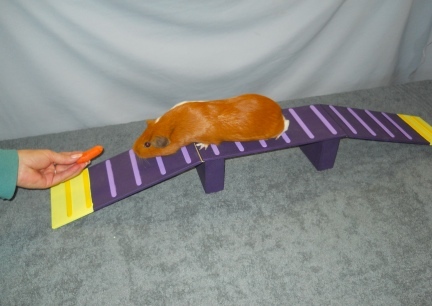 To teach your cavy to come over a Bar Jump set the cavy on the far side of the jump with you on the near side. Have your left hand on the Jump and with your right hand you could use a food treat to incise your pet over. Give the cue word "Over". If the cavy does not come over the Bar Jump, gently set it's front feet on the top bar, hold the feed treat just out of the cavy's reach and say "Over". When the cavy comes over the Bar Jump say "Good". Give the cavy it's food treat and verbally praise as well as pet the cavy. Repeat three times. On the fourth time do not set the cavy's feet on the top bar. But with your left hand on the Bar Jump move the jump so that it is ever in front of the cavy (if the cavy turns around to walk away, turn it forward toward the jump) call the cavy by name, tell it "Over" and incise it with the food treat. When the cavy comes over the jump, and it might take a minute or two, use the word "Good" and give the food treat straight away. Praise and pet the cavy. Repeat twice and stop Bar Jump training til later in the day or the next day. For the next day or two you might need to remind the cavy by setting it's feet up on the Bar Jump when first starting the training section. 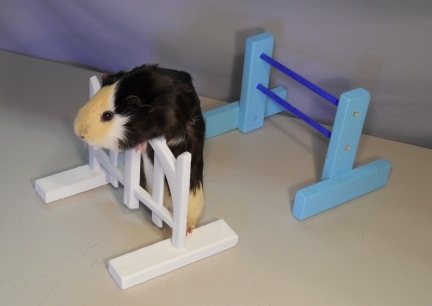 You will teach your Guinea Pig the Fence Jump just as you have the Bar Jump. Teach the Bar Jump first. Reason? Bar Jumps have horizontal bars, approx half way up, for the Guinea Pig to step up on, Not all Fence Jumps do. You might need to give your Guinea Pig a helping hand to learn this jump. Awwww, the Open Tunnel. A piece of Agility Equipment that is so fun for people to see animals coming through, and one that for small pet owners, lots of training goes into. If you can at all start with a Tunnel or Tube shorter then the body length of the GP. 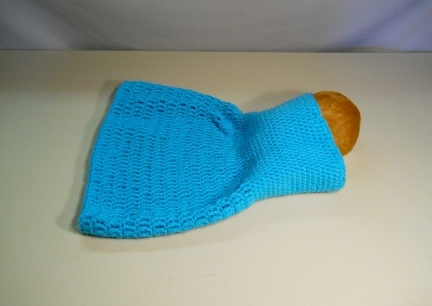 If you have a long fabric Tunnel turn it under so that it is about half the length. This way the GP is not completely in the Tunnel as it learns to come through. Using a food treat with training make sure the GP sees the treat at the out end of the Tunnel. Call or coax your GP through the Tunnel. Use the cue word "Tunnel" or "Through" as you call the GPs name. Do not give the treat to the GP until it is allllll the way out of the Tunnel. Be sure to give the word "good" as the GP comes out of the Tunnel. Praise and pet your GP after it comes through. Repeat three times. Then unroll the fabric on the Tunnel a few inches and repeat again. Once your GP realizes that it will receive the praise and mostly the treat for coming through the Tunnel it will repeat the task over and over. This is probably the hardest piece of equipment to teach a small pet. They love to go into tunnels and stay there, to nap there, to hide there. It is not going into the Tunnel you will be training, it is coming out of the Tunnel that will take some training. Since Closed Tunnels are made of a material that will fold, normally a plastic coated fabric or fabric, teach this Agility Piece as you did the Open Tunnel. Always remember to keep all training fun and fair to the animal. Keep it upbeat and don't loose your own sense of humor. As far as Jumps go this is a favorite for spectators, trainers and animals. Most GPs will, when trained, jump right through the Tire. Your tire of course, needs to be correct size for a Cavy. If it is too large it might be too high set for your pet. If the tire is too small it might be too tight for the cavy. 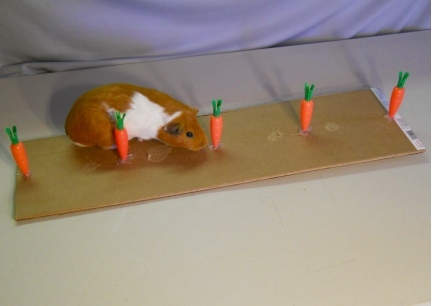 If you work with a carrot treat set the GP's front feet on the tire and hold a treat right where the cavy will see it. Give the GP a bite or small treat just for having it's feet up on the tire with it's face coming through. Encourage the GP through the tire with voice and treat...as soon as the GP comes through the tire, back feet on the far, now near, side of the jump, give praise with voice and treat. You might have to gently cup the rear of the GP as you pull the treat forward, give the GP a little help (from behind) through the tire, as soon as those back feet hit the ground. Give praise with voice and treat. Repeat. The Window of the Window Jump for a Cavy should not be too high. 3" to 5" from the bottom would be great. This would also be easy to train a cavy to come through. Because the Window is lower, the cavy will be able to see the opening and when taught understand that it is suppose to go through it. When teaching your cavy to come through the Window Jump (and the Tire Jump) I recommend the verbal cue "Through". "Over" means to clear the jump, go over the entire jump. "Through" means to come through the hole. 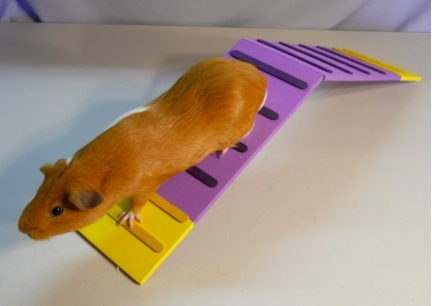 If you line your cavy up on the far side of the jump and hold a treat on the end side, call the cavy through the jump. You might need to set the cavy's feet up on the bottom of the hole so that it gets the idea that you want it to come through. If you have a food motivated GP this is where it is going to really pay off. Set your GP on the far side of the A Frame with you on the near side. Make sure that your A-Frame will not slide on the table you are using. Set a towel under it if necessary. Using a food treat, say the GPs name lead your GP over the A Frame and give a cue. We use "Frame" or "Over". When the GP gets off the A Frame. Say the word "good" and give the food treat. Repeat this three times. On the fourth time. Set the GP on the far side, call the GP and hold the treat where the GP can see it at the top of the peak of the A Frame. Call the GP's name and give the cue word you have chosen. When the GP gets close to the peak move the treat down to the bottom of the A Frame. When the GP starts the decline on the A Frame, move your hand with the treat out where the GPs head will be when it steps off the A Frame. Of course as soon as your GP is down, say "Good", give the treat and verbal praise and pet it. Your Teeter Totter should not be high set. A Sea Saw that has a higher pivot then a Teeter Totter, should not be used for a Guinea Pig. Most GPs will just go right along the Teeter Totter the first time out. Some however might be alarmed by the pivot. Use a food treat to entice your GP along the Teeter Totter and use a cue word such as "Teeter". Always, Always, Always give the GP a "Good" when it finishes a piece of equipment. After your GP has come across the Teeter Totter three times with your Food Treat encouragement. Try holding the food item on the off side (finish side) of the Teeter Board and call the GP. If your GP spooks when the Teeter Totter pivots. Don't act. Don't say anything, don't get excited. By doing that you will instill in your pet that there is a reason to be alarmed. Just set the GP back on the pivot point, keep your hand gently one it's back and entice it forward. As soon as the board pivots, tell the GP "good" and have it come right on off the board. Repeat. If the GP spooks again, repeat setting your hand on it's back. It has been called "Dog Walk", "Balance Beam", "Bridge" and I am sure a few other names. It looks a bit different for each species but really the same piece of Agility Equipment. For a GP it needs to be wide and low to the ground. you might even consider rails or sides. This should be an easy piece to train. Weave Polls might just be the hardest Piece to train any species. Usually there are five polls set up for the pet. The poles should for a GP be approx. 6" tall and placed approx. 7" apart in a straight line. Your pet should enter the line of poles with it's left shoulder headed toward the first Pole. You might start with three poles. Use your treat to lead the GP in the weaving pattern. When you first start give the treat to the GP as it weaves past the second or third pole. When it is weaving the three poles well, and only receiving a treat at the end of three poles, add a pole. There are some Over & Unders that are built in a box. The animal can make no mistakes. They are in a box so they won't leave the course, the over and the under give no choices, so how could the animal go wrong? And, there is little training in this type of box. Then there are the stand alone Over& Unders. These are a challenge for both the animals and trainers....and that is why these are, in my opinion the better set. With these you will need to start with one Over and one Under. How Many Pieces of Agility Equipment Should Be On The Course? The answer to this question can only be answered by the person setting up the course. That person however will need to factor a few things into the decisions of how many pieces they will set up for the Cavies. What Are You Setting Up For? If you are setting up for an Agility Event there may be an assigned amount of Agility Equipment to use per course. If you are just practicing at home it will depend on how far you are in your GPs training: how many pieces of Agility Equipment is already knows. If you are just starting to train your GP, you will only need one to three pieces of Agility Equipment. If you are setting up at an organized training section you might want to set up two courses of three rather then one course of six. Two reasons. One of the biggest reasons for organized practices is getting the animal used to all the stimulation, the air, smells, sounds, other people and other pets...and of course the interaction between owners/trainers. So a small course it good for learning these things. The other thing is, depending on how many people are there with GPs it gives everyone more of a chance to use the equipment and have a good time. After everyone has had a couple of times on the small course, set up a larger one and have everyone gather round to watch each GP. How Many Pieces Do The Guinea Pigs Know How To Manipulate? 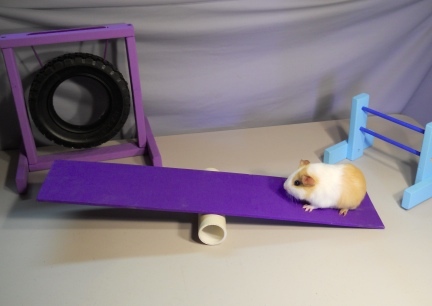 If you had 32 pieces of Guinea Pig Agility Equipment but you Guinea Pigs did not know how to maneuver the course, what would you have? You should use on a course as many or as few pieces of Agility Equipment that the animal can maneuver well. Now? 32 might just be tooooo many. But a course of seven or even 12 would not be too long for a trained GP and would be fun for people to watch. How Many Pieces Of Agility Equipment Do You Own? You might own three pieces of GP Agility Equipment and you might own 20 pieces of GP Agility Equipment. If you own three pieces, that is how large your Agility Course will be. It is far better to own three safe pieces of equipment and set them up than to have pieces of not so safe equipment just to have a larger course. Training is much more fun if you have human friends that are also training their animals. I am asked all the time where people can find others that are training their small animals Agility and or Tricks. I will bet if there are other GP owners near you they too would be interested in learning more about Guinea Pig Agility. You might want to start a group. I did this in WI by just setting a date at a park and inviting friends that had rabbits and ratties to join me there for the fun. I took the Agility Equipment I had for each species and we all had a ball. We met twice a month and ate out, dutch treat, after the event. Some evenings we had as many as 14 people that participated. Also, I invite you to join us on these Yahoo Lists below to brag on, talk about, ask questions, and send photos to. There are people "out there" that love to train their small animals too. 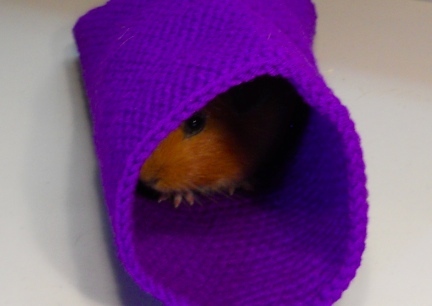 JOIN US ON THESE YAHOO GROUPS TO TALK ABOUT GUINEA PIG AND OTHER SMALL ANIMAL AGILITY. THE TALK THERE IS NOT LIMITED TO JUST AGILITY. IF YOU JUST WANT TO BRAG ON YOUR LITTLE PETS, WE ARE ALL EARS! The contents of this page for Cavy Agility Training is still under construction. Please check back later!